Does your home or business have toxic black mold? We can help. Mold growing in your home or office can become the source of serious health issues, so the problem must be addressed quickly before it worsens. When you have a mold problem, you also have a water problem. Without professional repair, leaky roofs and faulty plumbing create a damp environment that encourages mold growth. Our expert teams are highly trained in the inspection process that uncovers hidden mold even behind walls and under floors. We pinpoint moisture sources that cause mold to spread and take care of all necessary repairs. A careful and methodical approach is essential to removing mold from your Chicago property and ensuring the elimination of airborne spores. We tackle the toughest jobs including crawl spaces, basements, ceilings, furnishings and more. By using state-of-the-art equipment and protective gear, we remove all mold and prevent further outbreaks. Airborne mold spores can have a negative impact on customers and employees. Mold can cause extensive damage to your property’s floors, walls and ceilings. Our expert restoration work covers it all including moldy carpets, ruined sheetrock, stained ceilings and more. We restore your building’s interior health by completely eliminating all traces of fungal growth. Every project starts with our immediate response to your call. Mold damage must be addressed right away, so our fully stocked fleet vans are always ready to roll from our headquarters in Chicago and Skokie, IL. The details of how our mold remediation is done can vary, but we’re on the scene quickly to restore your property back to normal. Our technicians perform a comprehensive mold inspection of your property and present you with a detailed assessment. Whether we need to apply our mold remediation process in the basement, kitchen or attic, we explain everything so that you know exactly what to expect.We also carefully assess the condition of your personal belongings. When we’re done, we outline a clear, detailed picture of our action plan for your mold cleanup job. 3. Contain the Mold Infestation. Before starting any mold cleanup, we secure the affected area with physical containment barriers. We also seal windows and doors and turn off all HVAC equipment. This is done to ensure that airborne spores don’t continue to spread throughout your property. Our teams set up state-of-the-art equipment designed to remove mold spores from the air. This phase of mold remediation takes at least three days. Our air scrubbers, dehumidifiers and HEPA vacuum systems make sure that no spores contaminate the remaining remediation process. Often, your furnishings, drapes, bedding and clothing can be cleaned and sanitized with our mold cleanup services. Our technicians bag and remove affected belongings including personal items for off-site cleaning and odor removal. The final phase of our mold removal process involves any necessary rebuilding and restoration. 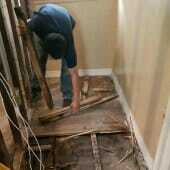 We take care of small repairs like replacing baseboards, and we reconstruct entire walls. Our teams do whatever it takes to get your property back to its original condition. 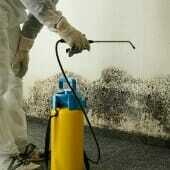 Toxic black mold is also known as Stachybotrys mold. Stachybotrys mold is one of thousands of mold species that grow inside and outside all types of properties. It reproduces and spreads through airborne spores that can survive harsh conditions and extreme temperatures. The spores can also travel in water, on animals and on clothing and personal belongings. This type of fungal growth is commonly found in properties after extensive water damage. The mold thrives in humid environments and wet conditions. It’s very hard to remove from cellulose materials such as drywall, wood and particleboard. If you suspect black mold is growing in your home or business, consider these important facts. • Toxic black mold can grow on exterior and interior surfaces. • Airborne spores invade a property through windows, doors and HVAC systems. • Black mold spores can also attach to pets and clothing. • The fungal growth gives off an unhealthy, musty smell that quickly spreads. • A critical part of the remediation process involves eliminating moisture sources that allow mold to thrive. What causes black mold to form? Any damp environment can result in an outbreak of toxic black mold. It might be the result of water damage after a flood, plumbing failure, frozen burst pipes or a hidden leak. High humidity can also lead to black mold growth, and it only needs oxygen as a food source. How can I tell if I have black mold instead of mildew? Homeowners often ask us about the differences between mold and mildew. Both are common even in the cleanest house, and they can resemble each other. Unless it spreads over large areas, mildew doesn’t usually pose the same health risks as mold. Try this simple test to determine if you have a mold or mildew problem. 1. Using a cotton swab, dab a little bleach on the affected area. 2. Wait a few minutes, and then check for a change in color. 3. If the area turns lighter, you’re looking at mildew cleanup. 4. If the treated surface remains dark, that’s a sure sign that it’s mold. Mildew is easily removed with a bleach solution or household cleaners, but always be very cautious about attempting mold cleanup until you know exactly what you’re dealing with. • It grows in areas that stay wet like crawl spaces with leaky pipes. • The mold is especially prevalent after a home or business suffers water damage. • Its growth pattern spreads through materials underneath the surface mold. • Toxic mold is often slimy with a dark, greenish-black coloration. 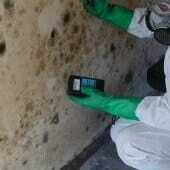 • The mycotoxins in black mold give off a strong, unpleasant musty odor. Every breath you take that’s contaminated with mold spores exposes you to a potential silent killer. All molds reproduce by releasing microscopic particles into the air. These spores settle on surfaces where they take hold and spread the mold’s growth. Because spores are microorganisms, they’re very easily inhaled. They can also enter the body through the eyes and settle on skin and clothing. While you can see mold growing on walls or floors, it’s impossible to detect airborne spores without taking samples. Black mold is considered toxic because its spores contain high concentrations of microbial volatile organic compounds and dangerous mold mycotoxins. The spores often affect people who have allergies or weak immune systems. Children and older adults and are especially vulnerable to airborne microorganisms, but a high concentration of black mold spores can impact people who normally enjoy good health. We handle the dirty, risky job of mold cleanup in Chicago so that you can enjoy a healthy home or business environment again. How do you ensure mold doesn’t come back? Mold can have many sources, so we don’t leave your property until we’ve completely taken care of all growth. We address water leaks that form the root of the problem, and we follow through with the steps necessary to make sure you don’t have to deal with another mold outbreak. Can you restore mold-damaged furnishings and personal items? While no two restoration projects are alike, we generally bag and remove items like bedding and clothing for off-site cleaning, sanitizing and deodorizing. As we work through the process to carefully remove mold from your belongings, you can rest assured that your things are in highly trained hands. Our IICRC-certified technicians use state-of-the-art equipment, industry-approved products and the latest techniques to gently clean your personal items. What do your services usually cost? The work in Chicago usually runs between $1200 and $4500. While that seems like a wide spread, no two jobs are the same. However, these figures cover the majority of our mold remediation projects. We outline more information here. Are there certain factors that affect the final cost? Can I get an estimate by calling your offices? Does my home insurance cover mold remediation costs? How much time does it take to finish a mold cleanup project? Do you use special equipment for mold remediation? Yes. Take a look at this page for a complete overview of our mold removal equipment.